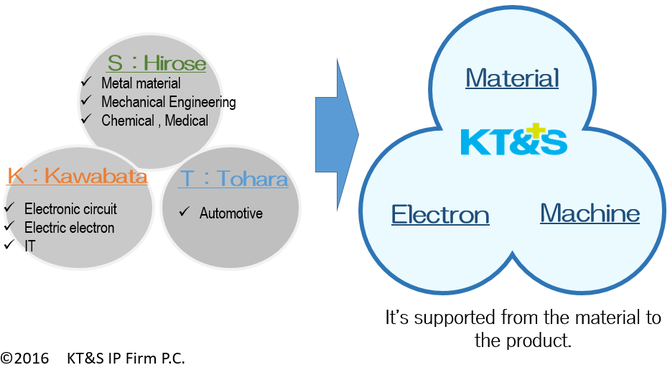 KT＆S is a full-service intellectual property firm based in Nagoya and Tokyo Japan. Our firm was jointly founded by Kenta Tohara of Nagoya ,and by Shoichi Hirose of Tokyo, Japan. As the founder and president of the patent law firm of S. Hirose & Associates, Mr. Hirose brings decades of invaluable intellectual property experience to our firm. As a former in-house counsel, Mr. Tohara has extensive experience in providing counseling and legal opinions concerning a full range of patent issues. We are confident of being able to provide our clients with the highest level of service in securing and protecting intellectual property rights. Mechanical , Electronics , IT, Metal Material, and Pharmaceutical field.